Herbertsmithite: Mineral information, data and localities. Named in honor of George Frederick Herbert Smith (26 May 1872, Edgbaston, England, UK - 20 April 1953), crystallographer and curator, British Museum of Natural History, London (England), who discovered the similar mineral paratacamite. The mineral smithite is also named after him. A polymorph of (metastable) kapellasite. 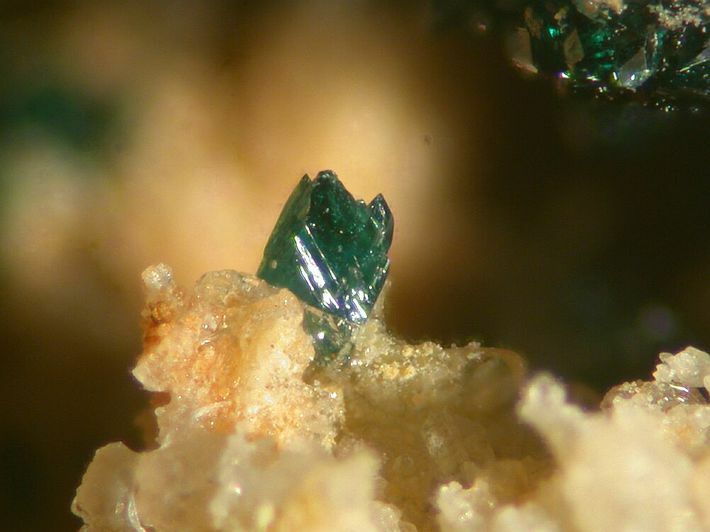 Closely related to paratacamite and easily confused with twinned clinoatacamite. On heating paratacamite reversibly transforms into herbertsmithite between 353K and 393K (Welch et al., 2014). The Zn analogue of gillardite and leverettite. This mineral gained attention in March 2007 when it was reported that it has very specific and unusual physical properties that make it behave as a new type of matter (see references). Platy, pseudohexagonal crystals to 0.5 mm (Iran); rhombohedrons and pseudo-octahedra to 1.5 mm (Chile). Rhombohedrons to 1.5 mm across. Wulfenite 16 photos of Herbertsmithite associated with Wulfenite on mindat.org. Christelite 10 photos of Herbertsmithite associated with Christelite on mindat.org. Linarite 7 photos of Herbertsmithite associated with Linarite on mindat.org. 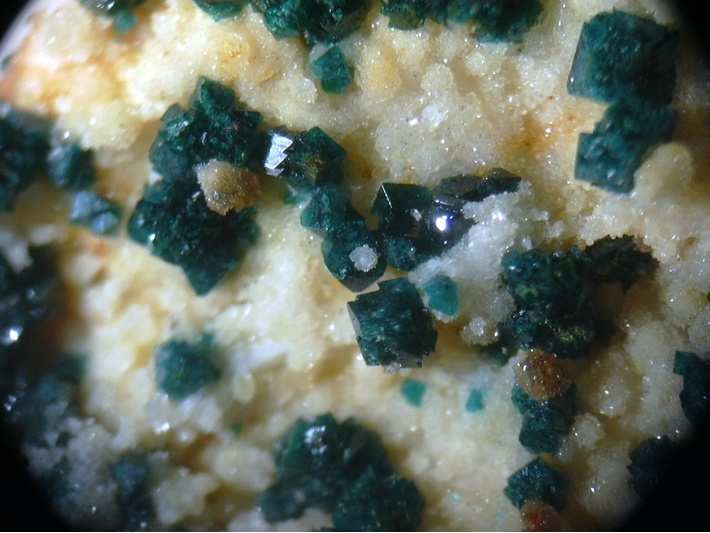 Malachite 7 photos of Herbertsmithite associated with Malachite on mindat.org. Chrysocolla 7 photos of Herbertsmithite associated with Chrysocolla on mindat.org. Coronadite 7 photos of Herbertsmithite associated with Coronadite on mindat.org. Cerussite 7 photos of Herbertsmithite associated with Cerussite on mindat.org. Quartz 2 photos of Herbertsmithite associated with Quartz on mindat.org. Bobkingite 2 photos of Herbertsmithite associated with Bobkingite on mindat.org. Gordaite 1 photo of Herbertsmithite associated with Gordaite on mindat.org. Braithwaite, R.S.W., Mereiter, K., Paar, W.H., Clark, A.M. (2004) Herbertsmithite, Cu3Zn(OH)6Cl2, a new species, and the definition of paratacamite. Mineralogical Magazine: 68: 527-539. Mandarino, J.A. (2004) New minerals. The Canadian Mineralogist, 42: 1901-1927. Weiß, S. (2004) Lapis: 29(12): 38-39. Jambor, J.L., Grew, E.S., Roberts, A.C. (2005) New mineral names. American Mineralogist: 90: 518-522. Misguich, G., Sindzingre, P. (2007) Magnetic susceptibility and specific heat of the spin-1/2 Heisenberg model on the kagome lattice and experimental data on ZnCu3(OH)6Cl2. The European Physical Journal B: 59: 305-309. Bert, F., Olariu, A., Zorko, A., Mendels, P., Trombe, J.C., Duc, F., de Vries, M.A., Harrison, A., Hillier, A.D., Lord, J., Amato, A., Baines, C. (2009) Frustrated magnetism in the quantum Kagome Herbertsmithite ZnCu3(OH)6Cl2 antiferromagnet. Journal of Physics: Conf. Ser. 145, 012004. Freedman, D.E., Han, T.H., Prodi, A., Müller, P., Huang, Q.Z., Chen, Y.S., Webb, S.M., Lee, Y.S., McQueen, T.M., Nocera, D.G. (2010) Site specific X-ray anomalous dispersion of the geometrically frustrated Kagomé Magnet, herbertsmithite, ZnCu3(OH)6Cl2. Journal of the American Chemical Society: 132: 16185-16190. Ofer, O., Keren, A., Brewer, J.H., Han, T.H., Lee, Y.S. (2011) The Herbertsmithite Hamiltonian: μSR measurements on single crystals. Journal of Physics: Condensed Matter: 23: 164207. Mendels, P., Bert, F. (2011) Quantum kagome antiferromagnet : ZnCu3(OH)6Cl2. Journal of Physics: Conf. Ser. : 320: 012004. Shaginyan, V.R., Msezane, A.Z., Popov, K.G., Japaridze, G.S., Stephanovich, V.A. (2012) Identification of strongly correlated spin liquid in herbertsmithite. EPL: 97: 5600. Nilsen, G.J., de Vries, M.A., Stewart, J.R., Harrison, A., Rønnow, H.M. (2013) Low-energy spin dynamics of the s = 1/2 kagome system herbertsmithite. Journal of Physics: Condensed Matter: 25: 106001. Welch, M.D., Sciberras, M.J., Williams, P.A., Leverett, P., Schlüter, J., Malcherek, T. (2014) A temperature-induced reversible transformation between paratacamite and herbertsmithite. Physics and Chemistry of Minerals: 41: 33-48. Sciberras, M.J., Leverett, P., Williams, P.A., Schlüter, J., Malcherek, T., Welch, M.D., Downes, P.J., Hibbs, D.E., Kampf, A.R. (2017): Structural and compositional variations of basic Cu(II) chlorides in the herbertsmithite and gillardite structure field. Mineral. Mag. 81, 123-134. 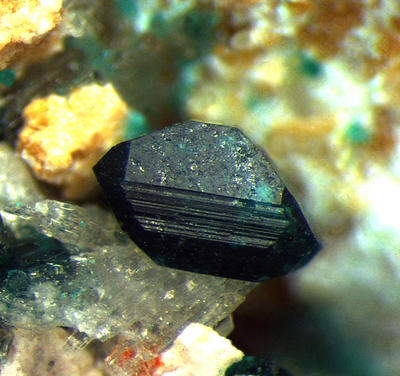 A few specimens have come from the mine labelled in the past as paratacamite. Testing in 2017 of two specimens from the same lot, has shown the material to be the rarer but related Herbertsmithite (Sue Koepke information). S. Weiß: Lapis (2004): 29(12): 38-39. Gatto Rotondo, G., Darchuk, L., Swaenen, M., & Van Grieken, R. (2012). Micro-Raman and SEM analysis of minerals from the Darhib mine, Egypt. Journal of analytical sciences, methods and instrumentation, 2(1), 42-47. W. Krause, H.-J. Bernhardt, R. S. W. Braithwaite, U. Kolitsch and R. Pritchard (2006): Kapellasite, Cu3Zn(OH)6Cl2, a new mineral from Lavrion, Greece. Mineralogical Magazine 70, 331-342; Kolitsch, U., Rieck, B., Brandstätter, F., Schreiber, F., Fabritz, K. H., Blaß, G. & Gröbner, J. (2014): Neufunde aus dem altem Bergbau und den Schlacken von Lavrion (I). Mineralien-Welt 25 (1), 60-75 (in German). S. Weiß: Lapis 29(12):38-39 (2004); Bariand, P. 1963. Contribution à la minéralogie de l’lran. Bulletin de la Société Française de minéralogie et de cristallographie, 86: 17-64. [Locality description in brief and mineralogical list with photographs] Bariand, P. 2003. Un apercu général sur la Minéralogie de I'Iran. Le Règne Minéral, 54: 41-51. Known only from one find, confirmed by several XRD.